Multi-keyboardist extraordinaire and producer George Duke’s passing was a major loss to the music world, but this fine tribute goes some way to celebrating his work. 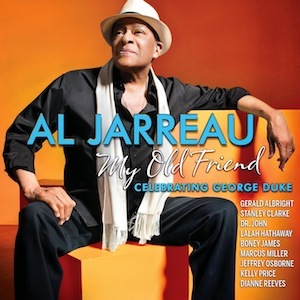 Al Jarreau, with a foot in both the jazz and soul idioms, is ideally suited to perform this task and has a musical relationship with Duke that goes way back to the mid-late 1960s when both were just making their way as musicians. In order to execute this task, Jarreau has enlisted a stellar cast of guest singers and instrumentalists, the latter including Patrice Rushen on fender Rhodes, Gerald Allbright on saxophone and Marcus Miller on bass. A real treat for George Duke fans is in store on three reprises of numbers from what remains his masterpiece, ”Brazilian Love Affair’. The title track is coupled with the sumptuously titled ‘Up from the sea it arose and ate Rio in one swift bite’ on a medley expertly delivered by jazz vocalist Dianne Reeves who of course has albums on the Blue Note label produced by Duke. Breezing in on a medium tempo is the retitled ‘Some bossa (Summer Breezin’ which Reeves once again handles with aplomb, while for some jazz-fusion flavours the Miles Davis ‘Tutu’ album that Duke performed on is recognised here by means of ‘Churchyheart (Backyard Ritual)’ which remains faithful to the original. George Duke branched out into the world of soul as a producer and here the hit single, which was a duet between Stanley Clarke and Duke back in the 1980s, is paid homage to with lead vocals courtesy of Lalah Hathaway. Jeffrey Osbourne scored a major hit under Duke’s production school and a medley of ‘Every reason to smile/On the wings of love’ conjures up that early 1980s feel. Jarreau himself excels on a reprise of his early 1980s song ‘Old Friend’ which is a fitting tribute while for a touch of left-field activity, look no further than the Duke composition ‘You touch my brain’, which features no less than Dr. John on lead vocals and this New Orleans-inflected interpretation ends the album on a triumphant note. Co-produced by John Burke, Stanley Clarke, Boney James and Marcus Miller, this is arguably Al Jarreau’s finest work in a good fifteen years since ‘Tenderness’ and is a welcome return given Jarreau’s own battle with health in recent years and he seems to have made an excellent recovery judging by this.